There is nothing quite like a creamy, no-bake layered dessert. Especially when those layers are chocolate and peanut butter. 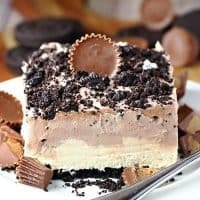 And believe me, this Chocolate Peanut Butter No-Bake Dessert is out of this world delicious! Really, something this good shouldn’t be this easy to put together, but it’s so simple, even my kids can make it with a little supervision. (No-bake recipes are always great options for kids in the kitchen). This recipe is loaded with so many of my favorites. Oreos and peanut butter cups, for starters. And then there are layers of both chocolate and peanut butter mousse. 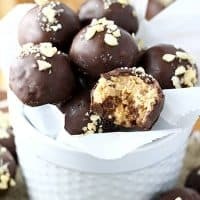 I have to give credit to my middle son, who is something of a chocolate and peanut butter fanatic, for discovering this recipe. From the first time we tried it, it was destined to become a family favorite. And the best part is, you never have to turn on your oven! This is a great dessert to take to a potluck or backyard barbecue. Just be prepared for it to disappear fast. And plan on getting lots of requests for the recipe! 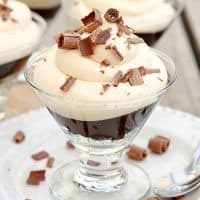 This recipe also works great layered in individual dessert dishes or Mason jars, especially if you’re entertaining and want something a little more elegant. Not that anyone will care what it looks like, once they taste how delicious it is! To make this dessert even easier to put together, use a box of chocolate cookie crumbs, rather than crushing your own Oreos. 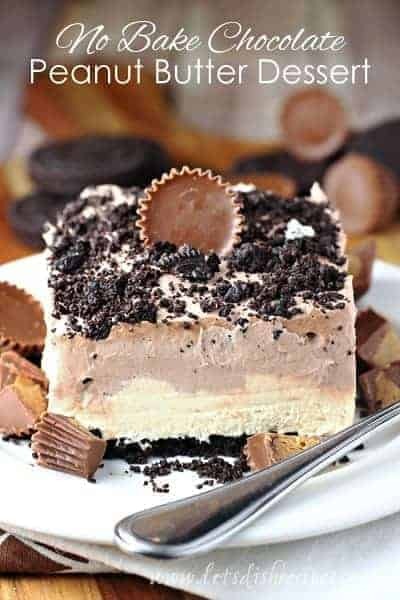 Of course, then you don’t have any leftover Oreos to eat…..
Be sure to save this Chocolate Peanut Butter No-Bake Dessert recipe to your favorite Pinterest board for later. 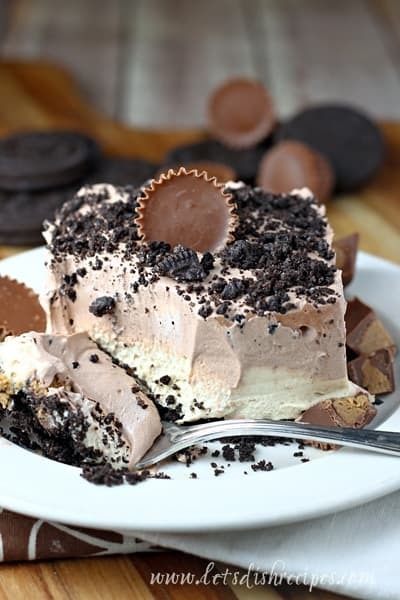 Peanut butter cups sandwiched between layers of chocolate and peanut butter mousse on an Oreo crumb crust. In a large bowl, beat the cream cheese, peanut butter and 1 cup confectioners' sugar until smooth. 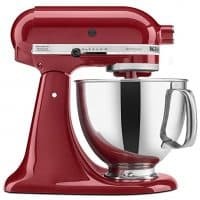 In another large bowl, beat the milk, pudding mix and remaining confectioners' sugar on low speed for 2 minutes. 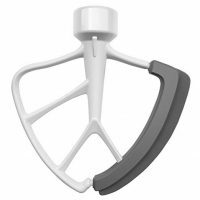 Let stand for 2 minutes or until soft-set. 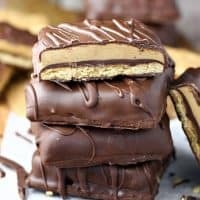 Graham crackers are dipped in chocolate, covered with a creamy peanut butter filling, then dipped in chocolate again to create these out-of-this-world peanut butter and chocolate treats! 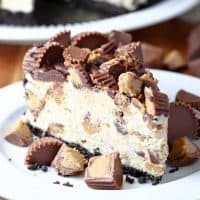 This decadent chocolate and peanut butter pie features a chocolate crumb crust, a creamy peanut butter cup studded filling, and a chocolate ganache and peanut butter cup topping. 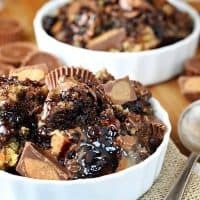 The ultimate dessert for peanut butter and chocolate lovers. 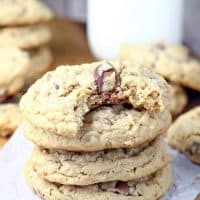 These loaded cookies combine some of your favorite ingredients in a big, soft, chewy cookie that's perfect with a glass of cold milk. Oh yummmmm! I’ll be making this, soon! I posted my version of your dessert on my blog, with a few changes. It is my VERY FAVORITE desert! thank you for sharing!!!! Mmmmmm….I’m making this for Christmas!! 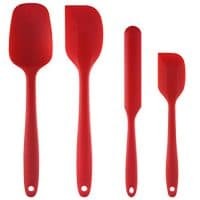 Could this be made in a 9×13 pan? Yes Raycinqueen, it would just be thinner, or you could double the ingredients. How many people could this serve? 8. It says it in the recipe, across from prep time. Marcie, it really depends on how big of servings you use, but it’s made in a 9 inch pan, so I’d say 8-10 people. Yikes sounds amazing! How many calories per serving? They credit you but in my opinion it’s never ok to paste in the entire recipe without permission. If you look at the author, Danielle M is the author of both! So I’d think she’s safe! Can this be mixed by hand? It probably could, although I think it would be challenging to get it smooth. I was wondering if almond butter can be substituted because of peanut allergies??? Any ideas on a substitute for the whipped topping? Do you think whipped cream would hold up ok? I really don’t know of a good substitution for cream cheese. Maybe Neufchatel cheese? This was DELICIOUS and so easy to whip up! Thanks for the recipe! When I make the Oreo crust on the bottom it won’t stick together… Is there something I can do to prevent this from happening! Please email me ASAP. Thank you! I have been wanting to make this for 3 months now and I finally can! It looks so good, and I’m sure it will be good! And I can do it in a 9 by 13 pan, right? 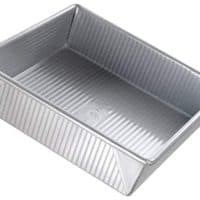 The recipe is for a 9×9 pan, so you could double it, or make it in a larger pan and it would just be half as tall. oh my goodness I have made this once,it is being asked again for me to make it. My mom has had this recipe for a few years now… and it is AMAZING. It is my all time favorite dessert, and whenever I get say in what dessert she makes, I insist on this one. Don’t question it. Try it. You can thank me later. Daughter and I made this today. can’t wait for it to chill so we can dig in! I made this for Christmas. I found this recipe to be very sweet. Next time I am going to reduce the sugar and see how it tastes. Do you leave the cream in the Oreos, or take it out? The recipe calls for 1 tub of cool whip, 16 oz. I just wanted to confirm if this truly calls for 16 oz.? I bought 2 tubs of 8 oz each but am wondering if I should really just use 1 tub of 8 oz. The tub says it yields 3 c. of whipped topping and 6 c. of whipped topping seems like a lot to fit in a 9×9 pan along with everything else. 16 oz. is correct. Half gets mixed into the peanut butter layer and half gets mixed into the chocolate pudding layer. Could this be made a day in advance or would it go bad?? If you refrigerate it, it should be fine. I would say no Sheila. I don’t think all the dairy products would do well being frozen. But I could be wrong. Is the 1 cup of milk in addition to the milk that the pudding calls for ? No, you beat that 1 cup of milk with the pudding. There is no additional milk.